Click here to view the game day program. 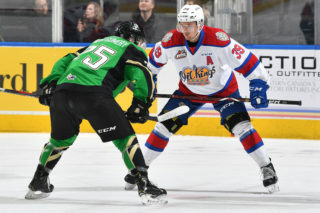 LAST GAME: The Oil Kings made it two wins in a row on Tuesday night as they continued their final three-game home stand against the Lethbridge Hurricanes with a 5-1 victory. In the first period, Hurricanes centreman Jadon Joseph opened up the scoring at 5:48 of the period to give Lethbridge a 1-0 lead through 20 minutes. In the second period, it was all Edmonton. Oil Kings captain Colton Kehler netted his 31st goal of the season on the powerplay to tie the game 1-1. Minutes later, Nick Bowman would send a quick shot on net and beat Hurricanes netminder Logan Flodell glove side to give Edmonton a 2-1 lead. At 14:50 of the period Conner McDonald tallied a goal on the powerplay to make it a 3-1 lead. Just over a minute later, Tomas Soustal scored another poweprlay marker to put Edmonton ahead 4-1. Trey Fix-Wolansky would make it five goals for the Oil Kings in the second sending a one timer past Flodell to give the home team a 5-1 lead through 40 minutes. 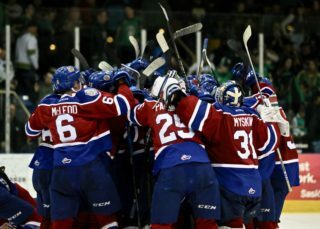 In the third, the Oil Kings would hold their four-goal lead finishing the game with a 5-1 victory over the Hurricanes. OIL KINGS VS. HITMEN: The Oil Kings have played the Hitmen four times so far this season putting up a record of 2-2-0-0. Saturday’s matchup will mark game one of a back-to-back against Calgary to close out the regular season for Edmonton. The last time these two teams faced off against one another was on Friday, March 2 at Rogers Place as the Oil Kings hosted their WHL Suits up with Don Cherry Night. In that game the Oil Kings defeated the Hitmen 4-3 in overtime. 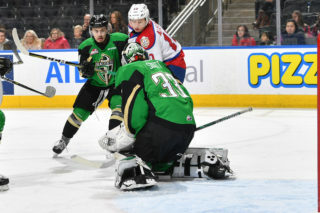 Oil Kings captain Colton Kehler scored the overtime winner on the powerplay just 18 seconds into the overtime period to secure the Oil Kings victory. MULTI-POINT: Two Oil Kings recorded a multi-point game on Tuesday night against the Hurricanes. Trey Fix-Wolansky recorded his 25th multi-point game of the season with four points (1G, 3A) and Kobe Mohr recorded his seventh multi-point game of the season with two assists. 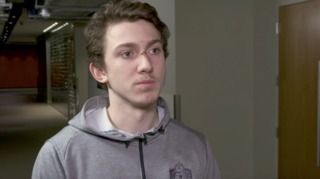 HOT STREAK: Tomas Soustal scored one goal on Tuesday night against the Hurricanes to extend his point streak to nine points (3G, 6A) in seven games. Conner McDonald (3G), Kobe Mohr (4A), and Matthew Robertson (3A) are on three-game point streaks. LEADING THE WAY: Trey Fix-Wolansky picked up four points (1G, 3A) against the Hurricanes on Tuesday night. Fix-Wolansky now has 16 points (5G, 11A) in his last seven games played. Fix-Wolansky currently leads the Oil Kings in points (87), assists (56) and is tied with Colton Kehler for goals scored this season (31). 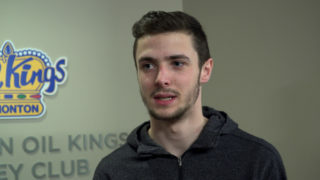 #200: Oil Kings captain Colton Kehler is just one game away from playing in his 200th career Western Hockey League (WHL) game. The right-winger has a career-high 49 points (31G, 18A) this season with Edmonton. ROYAL 100: Defenceman Conner McDonald played in his 100th game as an Edmonton Oil King on Tuesday. 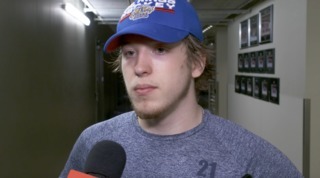 Through 100 games with the Oil Kings McDonald has tallied 55 points (17G, 38A). UP NEXT: The Oil Kings will play their final game of the 2017-18 regular season on Sunday afternoon in Calgary against the Hitmen. Puck drop is 2:00PM MT.